Our digestive systems are loaded with over 100 trillion bacteria, both good and bad. The metabolic activities performed by these bacteria resemble those of an organ, leading some to liken gut bacteria to a "forgotten" organ. It is estimated that these gut "flora" have around 100 times as many genes in aggregate as there are in the human genome. • Aid in prevention of allergies. 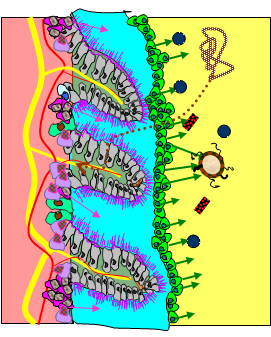 These microorganisms perform a host of useful functions, such as fermenting unused energy substrates, training the immune system, preventing growth of harmful, pathogenic bacteria, regulating the development of the gut, producing vitamins for the host (such as biotin and vitamin K), and producing hormones to direct the host to store fats. How good are these organisms at nutrient absorption? In studies, Rodents raised in a sterile environment and lacking in gut flora need to eat 30% more calories just to remain the same weight as their normal counterparts. But wait, you say, aren't Probiotics supposed to benefit weight LOSS? Yes, but keep in mind, it's the balance of bacteria that is important. There is plenty of evidence to suggest that when the body does not get enough nutrition, the metabolism slows down. When the metabolism slows the body does not burn fat and, depending on food intake, will store more fat. So doesn't it make sense that, when the balance of good/bad bacteria is off, nutrient absorption is lower and more fat is stored? Admittedly this is speculation on my part after observing 10 pounds of weight loss with no change in my eating habits. I've read that a good balance of bacteria is 80% "good" and no more than 20% bad. If we are helping to replenish the good bacteria and they are able to reproduce and restore the proper balance then our weight loss goals will be less challenging. Probiotics support healthy immune function as well. In the last 10 years research has determined that 70-80% of our immune cells are located in our gut. The bacteria are key in promoting the early development of the gut's mucosal immune system both in terms of its physical components and function and continue to play a role throughout life in its operation. Gut normal flora has a significant impact on the immune system; normal flora strains have been shown to induce the production of IL-10 (Interleukin 10), which has an important regulatory role in the development of the allergic immune response (Kalliomaki & Isolauri, 2003). Probiotics help prevent allergies, which is an overreaction of the immune system to non-harmful antigens. Studies on the gut flora of infants and young children have shown that those who have, or later develop allergies, have different compositions of gut flora from those without allergies. Other immune related diseases are benefitted by Probiotics and "good" gut flora also. Autoimmune conditions such as IBD and Crohns Disease are found in people who have a lower level of "good" bacteria and Probiotics are often prescribed, with good benefits. With autoimmune diseases such as Cystic Fibrosis and Lupus, Probiotics can possibly be life saving, or life extending. Two Italian studies found as much as a 50% reduction in symptoms and respiratory infections in CF patients, as well as a reduction in the inflammation that causes pain, when they were given probiotics. A study funded by the Lupus research institute found that probiotics help control lupus progression via induction of regulatory cells and (as found in the Kalliomaki & Isolauri study) IL-10 Production. Probiotics also protect against some forms of cancer, especially colon and colorectal cancer by reducing the "bad" bacteria and inflammation. So... now that we have an idea of the health benefits of gut flora... how do we know if we have a good balance... and what can we do to achieve it? That's the hard part. How do you know if you have the right balance? There are lots of things that kill off the good bacteria in our gut. Chlorine in drinking water for instance (I filter mine), as well as antibiotics which can kill off ALL of the flora, good and bad. Some foods like mushrooms, sweets, beer and wine, can deplete good gut flora, as can anti-inflammatory pain medications like acetaminophen, ibuprofen and ASA. If you don't eat organically raised meat... then you are eating meat that is pumped full of antibiotics as well (70-80% of the antibiotics produced are fed to farm animals). If you have any of the health issues above, or even just want a healthier, overall immune system without worrying about consulting a list of things you shouldn't be eating or drinking... then you should be taking a good quality probiotic. But what about Probiotics in FOOD, like yogurt? Aren't they enough or are probiotics in food just a lot of HYPE? Sadly, more hype than health. Experts are saying that the probiotics in food, or added to food, are not worth the additional cost. Additionally even PRESCRIPTION Probiotics are often ineffective and not worth the cost. There are lots of probiotics to choose from. A friend, who is a nutritionist, uses probiotics to aid weight loss with his clients. He has always recommended daily probiotics to build up the amount of "good" bacteria. Even researching and recommending the best, highest quality he could find, he found that it would take weeks, even months, to see a positive result. Still worth it, as he credits them with helping one client lose over 100 pounds. A couple of years ago he realized why it was taking so long for the probiotics to have an effect when he read the results of a study by Consumer Labs, as well as another "consumer watch dog" organization. In of of the investigations, over 50 brands of probiotics were pulled from shelves and tested. It was found that the amount of live cultures (remember these bacteria are a living organism) varied by over 10,000% (yes, that's not a typo - ten thousand percent). In one study over 25% of the pills had NO live probiotics in them at all and 40% had some dead, and/or mislabeled strains. Why is that? Were the manufacturers negligent? In some cases that might be true. But even the most careful manufacturer has challenges with the delivery system of probiotics. There are two "hurdles" these bacteria have to get by to "arrive alive" in your gut, where they are needed. First, they require a cool environment, even refrigeration. Sitting in a hot delivery truck or warehouse before being delivered to your pharmacy can mean you just paid $30-$40 for dead, or dying, cultures. The second hurdle is getting past the stomach acid. The reason that many probiotic brands pack billions of cultures in a pill is because the manufacturers know that many of the cultures will not survive the stomach acid. In fact, some experts claim as much as 90%, or more, will not survive the acid. The fact that most are in gel capsules means those poor little "germs" that are trying to help you get healthy are getting dumped (without life preservers) into a pool of potent stomach acid (ouch). Think the health claims of probiotics in yogurt are meaningful? "Watchdogs" don't. Dannon just settled a lawsuit about health claims of their Activa Yogurt. Sadly the media got the story wrong... with headlines that said "probiotics don't work." In some stories they did a bit better and explained, further down in the story, that the bacterias in the Dannon yogurt didn't show, in studies, to work any better than cultures in other yogurts. They STILL didn't quite get it right, though, because it wasn't the probiotics that didn't work... it was putting them IN the yogurt that was the "fail." You have to be diligent even looking at scientific "studies" of the effects of probiotics as often the studies don't reveal HOW the probiotics were delivered to the gut. In my opinion, that probably explains why two studies will have widely varying results... some showing a small benefit, some showing a much more dramatic one. Probiotics DO work… but only if you can deliver them ALIVE to your lower gut… where they take up residence, live and reproduce. Up until now, that meant getting them delivered rectally (another "ouch")... was the only guaranteed solution. SO… what you have to ask is... "what IS the "delivery system?." Lots of food products are touting they have probiotics. In my opinion, as well as those of many experts and "watchdogs," probiotics as food additives have only a small benefit or value, probably not enough to justify any increased cost of the product. "Unprotected" probiotic cultures in food simply don't survive the stomach acid in enough numbers to be effective. I recommended going for a probiotic SUPPLEMENT with a guaranteed delivery system. There is only one I'm aware of... the one I use, which is by a company that uses a Japanese technology that coats the probiotic with TWO layers of coatings that are designed to dissolve ONLY in the alkaline environment of the intestines, not the acid environment of the stomach. When you take the probiotic on an empty stomach, your stomach passes it through (as if it swallowed a rock), within about 10-20 minutes. Hurdle one is passed... it bypasses the stomach acid. I even take mine first thing in the morning for best results - when levels of stomach acid is the lowest. The second hurdle (refrigeration) is also addressed by the coating... as they are stable at room temperature for over 18 months. I like being able to carry them in my purse or travel with them, if need be, without worrying about finding a fridge or packing them in ice. I’ve been using them quite a while now, and I can say that, for me, the benefits were amazing. Weight loss, better digestion and a HEALTY immune system. In fact, an auto-immune disease I had that was supposed to be chronic and "incurable" … well, haven’t seen a symptom in over a year and a half now. I originally started taking them because of that auto-immune disorder. I knew only a little about them at the time, but my reasoning is... If I can see they can't hurt me, if some research indicates they MIGHT help me... AND if it doesn't cost too much... I'll give anything a try. Boy, am I GLAD I did! Additionally I've not had a bad flu or cold at ALL since I've been on them. I counted myself lucky (or smart) when a bad flu was making the rounds of my friends because I experienced some mild symptoms that came and went for several weeks (like a cold trying to take a "foothold"), but I never developed the "full-blown" flu at all, while my friends and business associates suffered off and on for weeks and spent hundreds of dollars at the Doctor while missing days of work or business appointments (what is the dollar value of being healthy for you? - have you ever calculated the cost of getting sick in lost wages, or productivity, as well as medical costs?). While you can get probiotics anywhere these days, I frankly feel the delivery system is very important to the efficacy; if they don't "arrive alive" they are not of optimal value. The company that makes the probiotics I use is called Qivana, and the probiotics are part of a 3 step integrated system called "Qore." Price wise, they are competitive with other brands on the market (about $20 for a months supply of the probiotics alone, $65 for the entire 3-part Qore System which has even more additional health benefits, supporting immune function, healthy cellular replication, reduction of inflammation, among others). Quality wise, in my opinion, these probiotics are vastly superior to everything I've seen on the market so far. Most people I've talked with see benefits in a matter of just a few days, to 3 months. Even more benefits if they are taking the entire Qore system. * Note that "prebiotics" are mentioned in the research. Prebiotics are the food that probiotics consume. Prebiotics will "feed" your 100 trillion little friends and are just as important, obviously. Google "prebiotics" and make sure you are including sources of them in your diet. Disclaimer: You can verify any of the information above by using Google and doing your own research. For interest of transparency I want to make it known that if you buy Qivana products from me, I do get a commission. In fact, that's one of the other things I like about their products... by helping other people, I get mine for free! Your bottom line is this. "Is it worth spending LESS than $200, which is a THREE month supply, to see if your health is affected for the better?" What if you no longer had to spend money on prescription drugs, co-pays, etc? What if getting healthier SAVED you a lot of money? Would you be interested enough to see if this works for you, like it has many others?